The Wooden First Vehicles set is a set of 3 vehicles, a car, a truck and an airplane. The chunky size makes these the perfect size toy for a Toddlers hands. 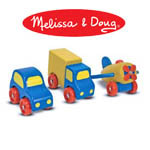 Melissa and Doug toys are very popular among parents and known for their high quality and durability. As with all Melissa and Doug toys, these are durable and should last through several years of play. You may also be interested to see more of the Best Melissa and Doug Toys we’ve highlighted on AllTheBestToys.com.